One of the reasons I write recommendations for the books I read is because otherwise, I wouldn’t remember them. Even at the age of 30, my memory is unreliable at best, full of holes and not to be trusted with the wedding photos. Sometimes my terrible memory is a boon. Watching movies is always a brand-new experience. I’ll express shock at a plot point, and Adam will say, “You’ve seen this before…” But to me, it’s like Kristen Wiig is tripping balls on an airplane and sneaking into first class for the first time. (Okay, maybe I can call up Bridesmaids in some detail, but it’s a glorious exception.) Am I mad at you? Not for long, probably! I forget about most arguments hours after they happen. (I know for a fact Adam has used this to his advantage on multiple occasions. It might be one of my best qualities as a wife.) In my dotage I’ll surely end up in a locked ward for the feeble-minded, but I will just as certainly not be bothered by it in the slightest, as I will be blissfully unaware of it. Of course, other times my memory lapses are not as beneficial. When I heard David Mitchell had a new book coming out this fall, my interest was piqued because I remembered reading and LOVING his 2014 novel The Bone Clocks. 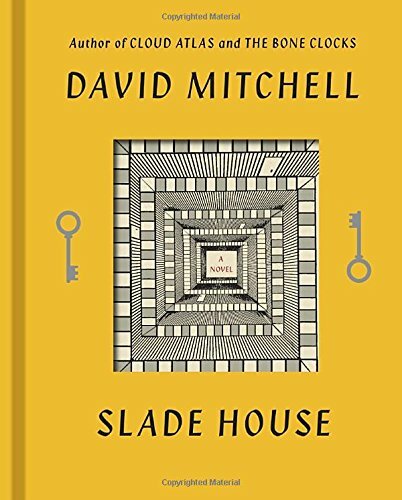 Rumor had it his new book, Slade House, would have some overlap with The Bone Clocks—not exactly a sequel, but a companion piece of sorts that would provide winking references to the other book that readers of both would recognize. And it’s entirely possible that is the case. But I can’t vouch for it. The knowledge that I enjoyed The Bone Clocks is firm in my mind. But all of the details of it—plot, characters, themes, what exactly a “bone clock” is—all of that’s gone now, evaporated into the ether along with locker combinations, birthday parties, and last Tuesday’s dinner. Sayonara. The good news is, I’m proof positive that you can enjoy this book without having read The Bone Clocks first. Slade House works fine as a standalone novel. And it’s perfect for this time of year—a time-bending haunted house story heavy on sci-fi elements, just literary enough to satisfy the reader snob in me. It begins on the last Saturday of October in 1979 and proceeds forward nine years with every subsequent section, cleverly wrapping up on October 31, 2015. There are creepy twins, a sinister, looming house with an overgrown garden, and a growing list of missing persons. With regards to Random House and NetGalley for the review copy. On sale now! TagsAcross the Pond, Darkly Surreal, Everything's Totally [Para]normal, Hallucinogenic, Missing Persons, They're Twins!